First Presbyterian Church is one of the oldest congregations in Lexington. The church was founded in 1784 and was then known as the Mount Zion Church. It was founded to serve the spiritual needs of the many Scotch-Irish who had migrated to the frontier in the soon-to-be state of Kentucky. Previous to the present building, the congregation shared a church with the Second Presbyterian Church. 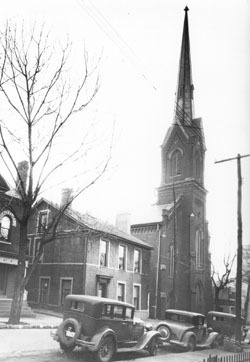 The First Presbyterian Church of Lexington was constructed in 1872 and designed by Kentucky architect Cincinnatus Shryock. Shryock was a member of the famed family of Kentucky architects of which one member, Gideon, is responsible for Old Morrison on the campus of Transylvania University as well as the Old State Capitol Building in Frankfort. First Presbyterian Church is executed in a simplified Gothic style. The building is visually impressive because of its large tower surmounted by a copper spire and arched stained-glass windows that highlight the façade. The interior of the building contains many natural woods as well as other Gothic architectural elements. The building is remarkably intact, reflecting both internally and externally its 19th-century appearance. Despite the growth of Lexington and the many skyscrapers within the city, the church still maintains a prominent place in the Lexington skyline. As the Lexington Observer & Reporter stated on May 8, 1872, three days after the dedication of the building: "In the erection of this beautiful ornament to our city, Mr. C. Shryock, the architect, had made a noble monument to his own skill and good taste." The First Presbyterian Church Lexington is located at 171 North Mill St. The church is adjacent to Henry Clay's Law Office and less than a block from the Hunt-Morgan House. Worship services of the First Presbyterian Church are held here weekly. For information about worship times please call 859-252-1919.